Jersey Cameron has always loved a good storm. Watching the clouds roll in and the wind pick up. Smelling the electricity in the air. Dancing barefoot in the rain. She lives in the Midwest, after all, where the weather is sure to keep you guessing. Jersey knows what to do when the tornado sirens sound. But she never could have prepared for this. 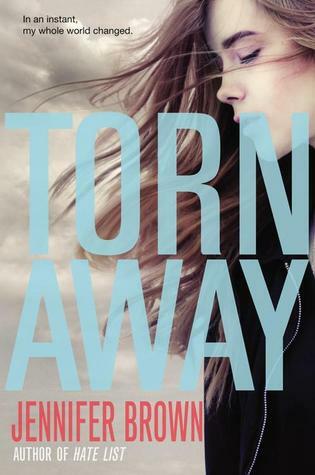 When her town is devastated by a tornado, Jersey loses everything. As she struggles to overcome her grief, she's sent to live with relatives she hardly knows-family who might as well be strangers. In an unfamiliar place, can Jersey discover that even on the darkest of days, there are some things no tornado can destroy? In this powerful and poignant novel, acclaimed author Jennifer Brown delivers a story of love, loss, hope, and survival. This book kind of wrecked me. It's been a while since I've felt such strong emotions about a character and wanted their happiness so much. Jersey seems like a regular high school junior. Her life is okay, she has her family, her best friends, and a cute neighbor boy. But all that is ripped away one day by a powerful tornado that levels her street and causes a huge amount of damage in her little Kansas town. The first 30% of this book is the most stressful because you're just waiting and waiting, full of dread. When the news finally hits, it just hurts. And it doesn't stop hurting. Ronnie, Jersey's stepfather, is overcome with grief and sends Jersey to live with the father she never knew and his terrible family. Okay, Terry isn't terrible, but the rest of them could really use a kick in the face. Especially Clay, her father. And her stepmother. And her half-sisters. Yeah, all of them. The part of the book when Jersey was at their house was the hardest to read for me. She had already gone through so much and the family treated her horribly. They had no sympathy and pretty much turned her into their own Cinderella. It was awful. Jersey's friends halfway help her, and eventually Ronnie picks her up. Brown makes you think that Ronnie has come to his senses, but that isn't the case. Instead, he drops Jersey off with her mother's parents. More people she had never met. It's obvious that Ronnie is grieving, but also that he's very selfish. He doesn't care about Jersey and, to me, it makes me think that he never did. Of course, Jersey doesn't take well to this. Her grandparents disowned her mother before Jersey was born and she can't help but resent them. Their relationship is rocky at best, but watching them get to know each other is almost sweet. Jersey butts heads with her grandmother, but she eventually learns more about her own mother and their relationship. I loved this part of the book, as sad as it was. Jersey has finally found someone who loves her like she deserves to be loved. Like her mother loved her. This was, as painful as it was, a great story. I read it in a day and couldn't get enough. I'm glad I finally picked it up.